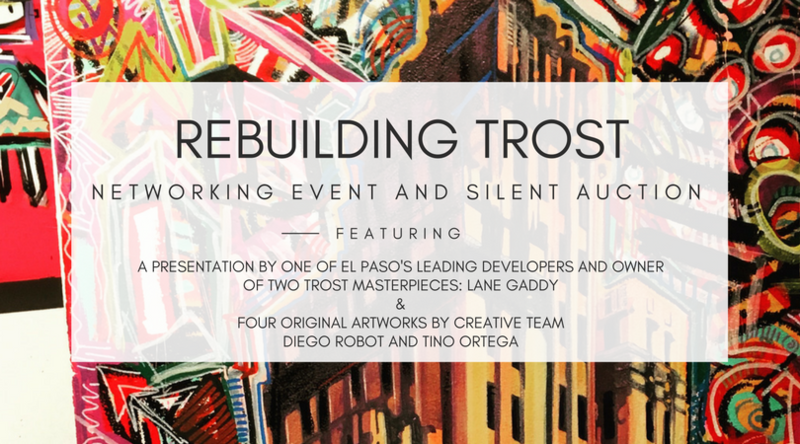 Please join us for Rebuilding Trost, a networking and silent auction event featuring a presentation by Lane Gaddy, one of El Paso’s leading developers and owner of three major historic buildings in the heart of our city. We will be auctioning four original art pieces created exclusively by Diego Robot and Tino Ortega for the Texas Trost Society. We will be hosting the event at Power of the Pass, one of El Paso’s up and coming spaces for collaborative artistic expression and film production. Tickets are $20 for Texas Trost Society members (includes admission, drink, and appetizers), and $45 for non-members (includes admission, drink, appetizers, and a one-year membership to the Texas Trost Society).